Don’t let the bad guys hook you! 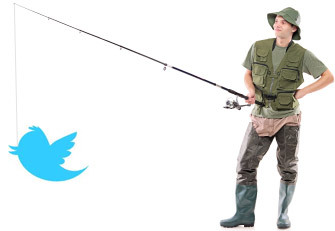 Clicking that link (which we’ve changed, of course) takes you to a Twitter login page that is really a phishing site. Once the bad guys have your Twitter login, they use it to phish in more of your friends and contacts and spam moneymaking schemes all over Twitter. We’re all used to being cautious where email attachments and links are concerned, but these newer social media exploits rely on people being less suspicious of links that show up via Twitter or Facebook. But of course you should still be wary when clicking any link that comes to you out of the blue, especially when it’s been cloaked using a URL shortening service. One way to check on such links is to use a site like http://real-url.org, which shows you the real URL behind the shortened version. Since we’re talking about Twitter, be sure to follow @Winhost. We’ll never steer you wrong!